The Broadway SkyTrain subway grift continues with a new band of suckers who will waste billions more of taxpayer’s monies on a politically prestigious transit project. So, Vancouver’s carpet-bagging Mayor (former Burnaby NDP, MP) is continuing the subway grift, where Vision Vancouver was so rudely interrupted by the voters in last falls civic election. Facts don’t change (except for TransLink that is), the North American standard to build a subway is a transit route with customer flows exceeding 15,000 pphpd, yet customer flows along Broadway are under 4,000 pphpd in the peak hour. The result is easily predicted. Operating costs will be an additional $40 million or more annually. U-pass will be in jeopardy. Taxes in metro Vancouver will skyrocket. Transit South of the Fraser will be cannibalized to subsidize the City of Vancouver and UBC’s $7 billion subway folly. Oh yes, I almost forgot, land speculators and land developers will reap fortunes from up-zoned properties along the subway line, selling high-rise condos to the foreign money laundering crowd! I am so glad that the former NDP MP, now mayor of Vancouver is so on the side of land speculators, land developers and money launders at the same time paying lip service to the homeless and housing affordability. Subways make affordable housing impossible. SkyTrain at grade and the Berlin Wall effect. VANCOUVER (NEWS 1130) — When rapid transit is expanded to the University of British Columbia campus in Vancouver’s Point Grey district, the preferred option is SkyTrain. That’s what Vancouver Mayor Kennedy Stewart is saying about recommendations to be reviewed by the Metro Vancouver mayors’ council on Jan. 24. “Seems to be a lot of enthusiasm among the other mayors for this project, and very excited that’s moving forward. I think everybody’s seeing this as a regional project where, for example, the mayor of Coquitlam’s very excited about getting students to UBC, as well as other mayors around the region,” Stewart says. Back into the swing of things at City Hall with my first media briefing of the new year. I mentioned my work on SkyTrain to UBC, motions to review the empty homes tax and increase support for Councillors, and upcoming meetings with the Prime Minister & Premier. The report, reviewed in private last week, will be openly discussed at the Metro Vancouver mayors’ council meeting and Stewart is confident other mayors will support these plans, even if they don’t know yet how much it will cost. Stewart adds the report recommends planning should fall in line with construction of the Broadway to Arbutus line which is slated for completion in 2025. More details, including how much this extension might cost, will be discussed at Thursday’s meeting. Stewart also plans to talk about it with Premier John Horgan Tuesday Jan. 22, and on Monday Jan. 28 with Prime Minister Justin Trudeau. I am lost for words, do your planners prefer to have a Berlin Wall like transit line slicing through a housing district, rather and a tram? Developers are the ones that benefit, so maybe they should pay a good chunk of costs? Zwei replies: You are a rarity, you understand the the problem and the financial burden of SkyTrain. Most people think its free. If more people researched the real costs of transit, especially the proprietary SkyTrain light-metro, they would understand why no one else around the world wants it. The new mayor of Vancouver is smart and listens to what the people of Vancouver. They want Skytrain to UBC and Langley. It will be money well spent. Paul, the new Mayor is not listening to anyone, but carrying on where mayor Moonbeam left off. As well, you haven’t a clue about financing and the long term effects of transit financing, which leads to school and hospital closures. 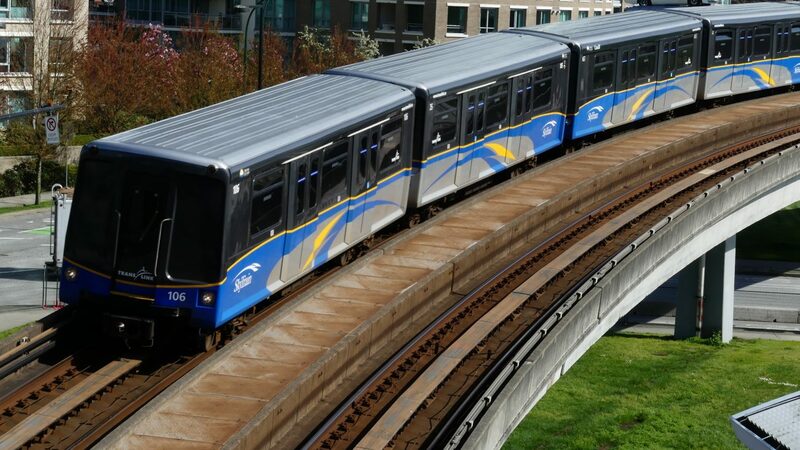 Like it or not, Bombardier is slowly phasing out SkyTrain, and why not, Vancouver is the only customer. Finally, there is no funding to UBC or Langley and I doubt there will ever be any funding. Vancouver is not the only customer. Saudi Arabia is the biggest customer with 6 lines and 84 stations. It is currently under construction and to be completed in 2019. Zwei replies: You are only partially correct as both Siemens and Alstom are providing metro cars as well. The Innovia cars being delivered are powered conventionally and not by LIM’s making the cars non compatible with our SkyTrain. As well, they are only going to used on Line #3. Anyways, the Saudi’s have billions and billions of dollars to spend on show case transit systems. The Saudi’s use it on one line, not 6. In fact, they might never order it again because of issues in the implementation process and because we (Bombardier and quite a few worried Canadians) asked questions when they configured cars for just women, families and children, that had an inward looking attendants booth that really had nothing to do with train operations but seemed perfect for surveying the women and children inside the vehicle! Something ideal for Saudi’s famed religious police. The lack of any observation booth on any of the men only cars was quite compelling. Saudi designers claimed it was so an attendants could respond quickly to problems and questions from female passengers or families needing assistance with children. The design proved problematic for capacity and passenger flow issues so it was dropped. There still however are seperate men only cars and cars for women, families and children, just no attedants cab. 1. No LIM Propulsion Units, instead standard 5 pole electric motors they were cheaper! 2. No Bombardier Cityflo 650 Train Automation System but a locally designed and built Saudi unit, based on the Alston and Siemens equivalent to Bombardier’s system. 3. No steerable trucks, a standard Alstom boggie/truck was used because its easier to maintain. 4. Siemens power equipment was used for track and signal equipment. 5. The familiar Skytrain body shell wasn’t used but a body shell from a Bombardier EMU for mainline railways. 6. Alstom designed couplers and frame mounts were chosen instead of Bombardier’s. 7. For some strange reason that I can’t figure out, locals chose Siemen’s car body door provider to supply the doors on a Bombardier shell (you are just begging for problems when you do that). 8. Local providers designed the Sub system processors for the main signaling system. What Bombardier did provide was the base frame (main floor steel plate that everything else in the car is attached to). Conduit and Shell frames. Most but not all of the signal and data processing systems for communications between the motors and automation system as well as the signal/communications systems and network. Much but not all of the programming and systems architecture. The vehicles were assembled in a Saudi based Bombardier affiliate manufacturers facility. Other than that, Saudi’s built a rail transit vehicle just like the Skytrain in Vancouver. Thank you for the details of the Saudi order.